The pin(s) are awarded each year in a different color. The 2019 pin color is Fuchsia. 3/4" diameter. Clutchback. Imported. Each membership star stands for one year of registration. Each membership star stands for one year of registration. 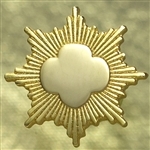 Place the stars directly beneath the troop/group numerals on the sash or the right side of the vest, Senior Girl Scout stars (on RED discs), (to the right of other membership star levels, if applicable). Gold Awards are not available for purchase online. For further information, or to purchase (with council approval), you may call Customer Service at 800-827-9478. Gold Awards are not available for purchase online. For further information, or to purchase (with council approval), you may call Customer Service at 509-747-8091. Moving from one Girl Scout age level to another is called bridging. Moving from one Girl Scout age level to another is called bridging. 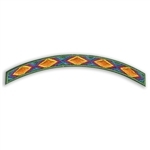 See product listing for ordering info The My Promise, My Faith Pin is earned by girls who want to find out what their faith and Girl Scouting have in common, using the Girl Scout Law as a guide. There is a different pin for each year a Girl Scout earns the recognition. Girls can earn this pin once a year at each grade level. 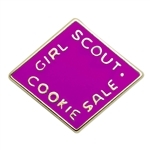 The color of the pin corresponds to Girl Scout Senior grade level color. Imported.